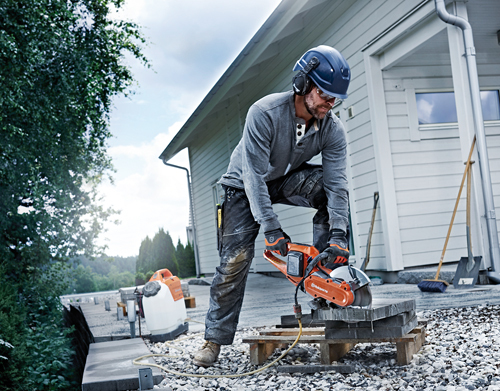 The latest addition to Husqvarna’s battery-powered range, the Husqvarna K 535i battery power cutter, builds on its fuel- and electric-powered equivalents, while adding benefits such as low vibrations, low weight and user-friendly ergonomics to the mix. It is almost maintenance free and offers a low cost of ownership. And on top of that, you can easily use it for wet cutting. The excellent power-to-weight ratio makes the K 535i a truly useful addition to any landscape or hardscape contractor’s equipment range – perfect for quick, efficient cuts. And since it does not depend on power from the grid, it can be used wherever it is needed. Husqvarna battery-powered products are a versatile range of handheld equipment for lighter landscaping or hardscaping jobs. Lightweight and powerful, they all operate on a “one-battery” system and offer a large number of benefits. The absence of exhausts, the low noise and the low vibration levels are just a few of the benefits.